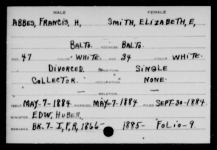 Join the Maryland Genealogical Society online as we launch our project to index the Baltimore City Court of Common Pleas Marriage Index from 1851 - March 1885. 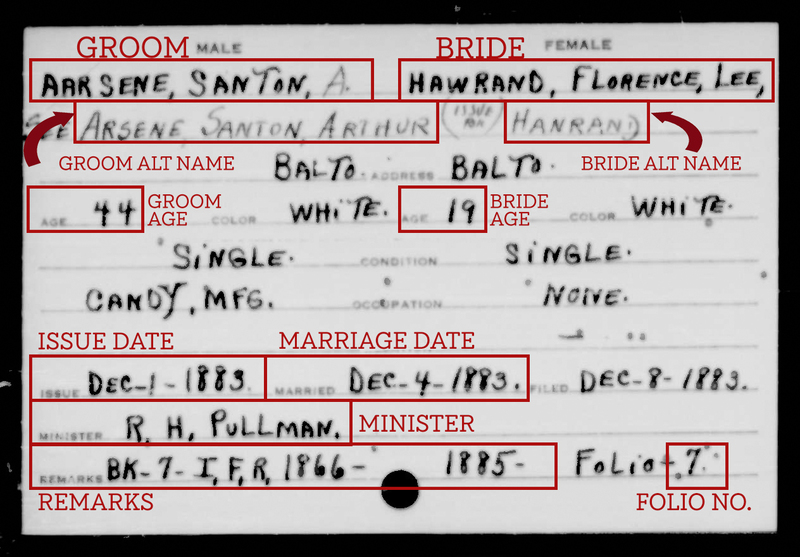 The Marriage Index resides at the MD State Archives and is available in PDF form online (Series CM205) but only in image format arranged alphabetically by groom's name. 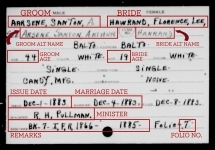 The Marriage Index contains more information on each card such as the couple's names (groom and bride), ages, and residences of bride and groom; date of marriage, minister's name; and book/page references. It is our goal to index these valuable marriage records so they can be searchable by several fields. Researchers can then seek the original Marriage Index record for more genealogical information. 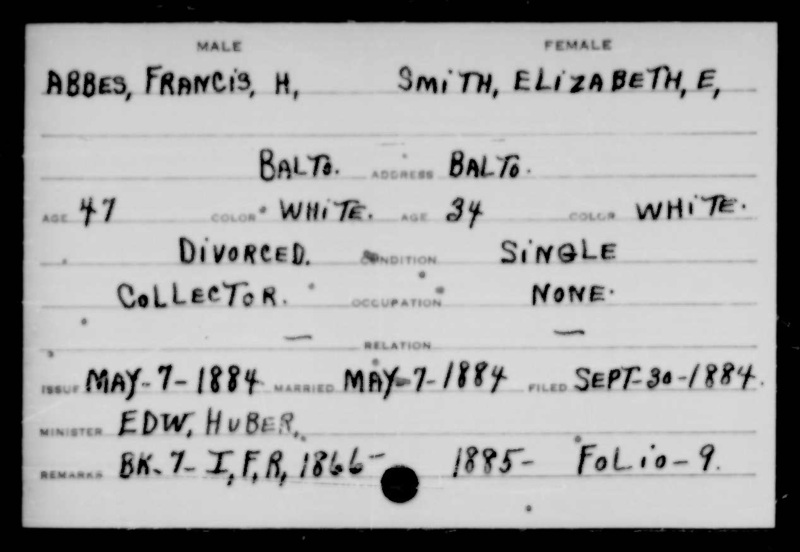 In the meantime, if researching Baltimore City marriage records at the MD State Archives, see Series CM205 available online or related series- MSA C212 for 1851-1885 (paper only) and MSA T2426 for 1886-1914. Series not fully processed and exist "as is" at time of scanning. Dating inconsistencies exist. - Fill in "GROOM" for Male or "BRIDE" for Female. Grooms are on the left side of the card, brides are on the right. - Please first fill in the SURNAME as it is written on the card. - Then put only the first name or initial written on the card in the FIRST NAME field. - If a middle name, middle initial or multiple names/initials listed, please type all in the MIDDLE NAME field. Please put spaces between multiple initials. - For the MINISTER field, the card may list a surname only, a full name, or a name and initials. Please enter exactly what you see for Minister on the Marriage Index card in the Minister Surname, First, and Middle Name fields. - If an ISSUE date is listed, please enter the information listed in the ISSUE MONTH, ISSUE DAY, and ISSUE YEAR fields using the specified format. - If a MARRIAGE date is listed, please enter it specifically in the MARRIAGE MONTH, MARRIAGE DAY, and MARRIAGE YEAR fields using the specified format. - Please do *not* enter the Issue Date in the Marriage date fields or vice versa. Only record the date information provided to the appropriate fields. - We are not indexing the FILED Date at this time. Please do not enter that date in either of the Issue Date or Marriage Date fields. - Please enter exactly what is written in the "Remarks" field on the card in the REMARKS/COMMENTS field. This information may vary greatly card to card as it was recorded by the original handwritten indexer. - Square brackets always signal that legibility is an issue. Do not use round parentheses when transcribing. - If part of a word, or a whole word or a phrase is illegible, use square brackets to enclose the difficult part. - Question marks can be used if you index the entire work, but have doubt about that word. - A single question mark in square brackets can be used if you are unsure of a single letter in a name/word. - If multiple letters are unreadable, dashes within the square brackets should indicate the number of letters that are in question within a particular word/date. If any entire field is unreadable, please use the name of the field in square brackets, e.g. [SURNAME] OR [GROOM'S AGE]. This will indicate that there is content on the card, but it was unreadable on the digital image of the marriage index.